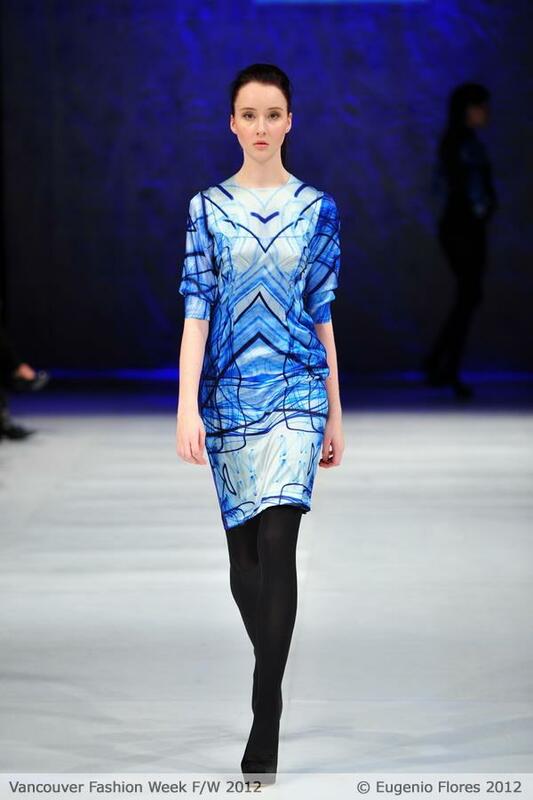 Vancouver Fashion Week's fall/winter 2012 season just took place last week. While I wasn't able to go to the opening gala or the weekday shows, I did manage to catch Saturday's shows, including the one I'm recapping here: Xsenia & Olya. The London-based design duo, Xsenia Runa and Olya Shishkina, first met as students at Central St. Martins. They had already debuted their spring/summer and autumn/winter 2012 collections in London and Paris before coming to Vancouver. 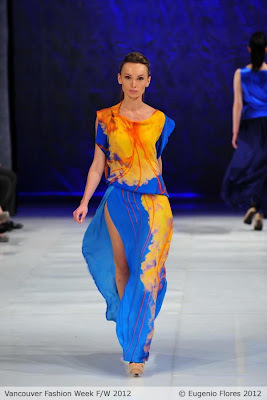 Their spring/summer 2012 collection, titled "Staircase Wit," drew inspiration from Madeleine Vionnet and photos of jellyfish at the Vancouver aquarium. The result was a breezy collection of bias-cut maxi dresses with thigh-high slits. Streamer skirts and tunics fluttered with movement. The digitized prints--in a South Beach palette of cobalt blue, teal and orange--were eerie yet elegant. Floaty dresses in red, purple and mustard rounded out the collection. 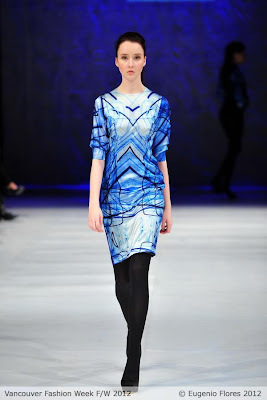 Their fall/winter 2012 collection also featured rich cobalt blue prints on maxi gowns and tunics, this time paired with reversible outerwear by Olya Shishkina. My favourite piece was a classic-cut belted brown leather trench with fur panels and lapels (not shown here, unfortunately). Their intriguing designs, combined with their zero-waste pattern-cutting techniques, are a testament to Xsenia & Olya's skill. I'm eager to see where their aesthetic goes from here. 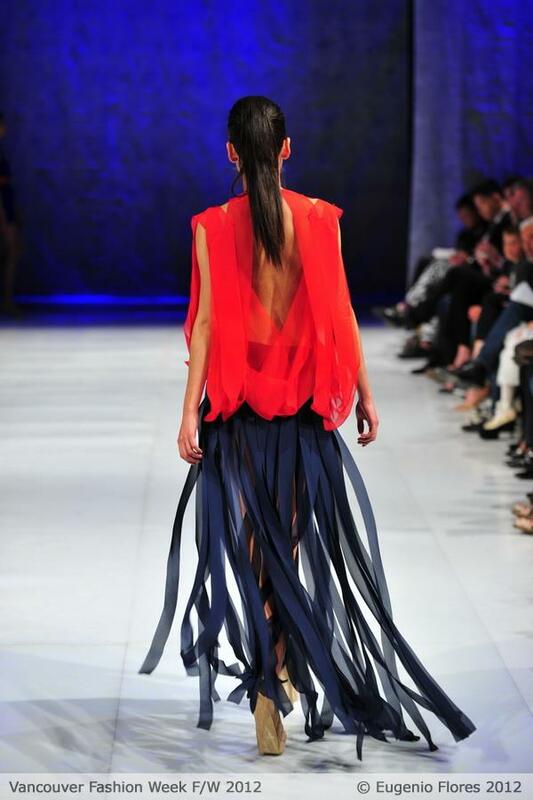 Photos from the Vancouver Fashion Week Facebook page by Eugenio Flores. I like the dress in the second photo. I love how unique everything is. I hate looking like everyone else. I love that you drew that link to jellyfish, I totally see it now! Such beautiful colours and prints! I can definitely see the jellyfish in that first dress - probably because I took a similar picture of one at the Vancouver Aquarium this weekend. Looks like a pretty and colorful collection.